"Outside of a dog, a book is a man's best friend. Inside a dog, it's too dark to read". This is by Groucho Marx. He is so hilarious. I love all of the Marx brothers' movies. His sense of humor has really inspired me through the years. And it is such a versatile quote. It is about dogs. It is about books. I always have it ready to use in my mind when I am doing a training. I love his wit. I love to read and I love dogs so this quote is a natural for me. It really helps me relax and connect with the audience when speaking publicly. It is simple and it rolls off the tongue. 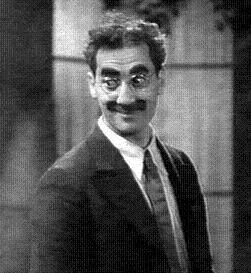 Jeff, thanks for this funny quote from Groucho Marx.